India's Reva (RECC) electric car company, based in Bangalore, has announced a new model of their small battery powered city car. Reva decided to take a conservative path with the new model, the REVAi, which looks outwardly the same as the previous production model. They decided not to use the sports styling cues of the Reva NXG show car. REVA will be selling the car in Norway and Spain, as well as the previous markets of India, UK, Spain, Norway, Cyprus, Malta and Greece. 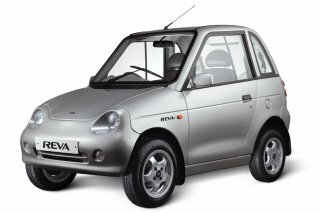 Unfortunately, it looks unlikely Australian authorities will permit the Reva in Australia any time soon. Reva claim the new model has 40% more mid-range torque and a "Boost" mode for short acceleration (but no word on the effect on battery life of this). A brushless motor is used with a "hill restraint" feature. Regenerative braking is now used to recover energy to the battery. An electronic speedometer provided and a computer derived indication for power consumption and power recovery through braking. For more affluent customers the REVAi has options of a CD/ MP3 player, Climate Controlled and Leather Seats. However, the REVAi does not appear to use the innovative dashboard Linux computer of the Reva NXG. For the Indian market, the Reva is described as seating two adults and two children. But in Europe, it is comparable in size to the two seat Smart car. Bangalore, July 25, 2007: On a constant journey towards providing consumers with environment friendly and intelligent solutions for city mobility, REVA Electric Car Company (RECC), has launched the advanced REVA car, the REVAi. The REVAi comes with a host of technological advancements and features that will benefit both the consumer and the environment. Key to this technology is the AC drivetrain. This advancement in technology will give customers a greater driving experience, increased speed, range and acceleration. The REVAi also comes with improved aesthetics and interiors to further enhance the customer’s experience. The improved motor in the REVAi comes with a 40% increase in mid-range torque, this results in better acceleration and climbing and also has a ”Boost” mode for short-term acceleration/power. The maintenance-free brushless motor provides a smoother, quieter operation and would deliver greater efficiency and thus benefit the environment significantly. In addition, the unique “hill restraint” feature allows enhanced negotiation on slopes. Other features of the new REVAi include, improved braking by using advanced regenerative braking and disc brakes, an anti-roll bar for better handling and an advanced IPC (Instrument Panel Cluster) with an electronic speedometer, a trip odometer and an automatic computer-controlled indicator for power consumption and regeneration. The new REVAi’s technology is now compatible with battery technologies of the future, thereby making it upgradeable. The REVAi also comes with options such as a CD/ MP3 player, Climate Controlled Seats, Leather Seats, and environment friendly, colour impregnated panels that are scratch and dent proof. The REVAi starts at Rs. 3.49 lakhs. Speed: Up to 80 km / hr as compared to 65km/hr in earlier models. Power Mode: Improved torque up to 40 % more than earlier model for better hill climbing and negotiation of slopes. Hill Restraint: Automatic hill restraint feature. Acceleration: 0-40 Km in 7 Sec as compared to 10 seconds in earlier models. IP Cluster: Trip odometer. Automatic computer controlled indicator for power consumption and regeneration. EMS: Improved battery management and failure detection software. Anti Roll Bar: Reduced body roll and improved handling at higher speed. Climate Control Seats: Optional. Cools and heats the passengers directly. Upgradeable: Newer electronics make it upgradeable to future battery technologies. The REVAi is a rugged two-door hatch back that can seat two adults and two children comfortably. It is the most eco-friendly and economical car in the world and offers ease of driving (no clutch or gears), and ease of parking due to easy maneuverability leading to a high level of reliability and safety on city roads. It heralds a new era in the technology of electric city mobility –a cost effective, hassle free mode of city mobility with zero pollution. REVA Electric Car Company Pvt. Ltd. (RECC), based in Bangalore, India, was started in 1994 as a joint venture between the Maini Group, India, and AEV LLC, California, USA, to manufacture environment-friendly and cost-effective electric vehicles. Seven years of R&D earned RECC recognition in the form of 10 patents and a globally accepted product. REVA, India's first zero polluting Electric Vehicle for city mobility, was commercialized in June 2001. The success of commercializing REVA at affordable prices stems from the support it has received from the Maini Group. The Group has been committed to producing zero-pollution transportation equipment since 1984 and automotive components since 1973. The Maini Group also produces battery operated materials handling equipment and off-road electric vehicles. The REVA Electric Car Company Pvt. Ltd. is located at the Bommasandra Industrial Area in Bangalore, India. The company has an installed capacity of 6000 units and over 275 employees. The existing model of the EEC-certified REVA is currently available in India and marketed in U.K. Norway, Spain, Malta, Sri Lanka, Cyprus and Greece. With over 2000 vehicles on the road, REVA is also being test marketed in Japan other European countries. RECC’s vision is to establish a tradition of excellence and leadership in environment friendly urban transportation by offering the best value and highest quality electric vehicles for city mobility. Copyright © Tom Worthington 2007.